BVI is a British Port of Registry and all ships registered here are designated British ships and fly the BVI Marine Ensign (British Red Ensign with the BVI crest). The BVI is amongst a select group of Caribbean destinations that enjoy the benefits of being part of the United Kingdom s Red Ensign Group of Registries and are now recognised worldwide as having an international Category 1 ship registry operating to the highest standards of a British Port of Registry. Ships flying the Red Ensign, such as BVI registered ships, are entitled to British Diplomatic/Consular support and Royal Navy protection. BVI has access to the range of technical expertise of the UK Maritime and Coastguard Agency. Low initial registration and annual renewal fees. Internationally accepted yacht registration and certificates – BVI is not a flag of convenience. Availability of provisional registration to meet varying circumstances. Simple and secure registration of ship mortgages, discharge of mortgages, change/transfer of ownership and other proprietary interests and services. Reasonable ownership qualifications (including ownership by a BVI company). Full corporate, legal, telecommunications and courier services readily available in the BVI. Political and social stability in BVI and British judicial system. Prompt, courteous and efficient service and fully computerized fleet management system and database. Convenient berths, accommodation, supplies and dock side services if planning to sail in BVI waters. For a ship to be registered in the BVI as a British ship, it must be owned as to at least a majority by a "qualified person". 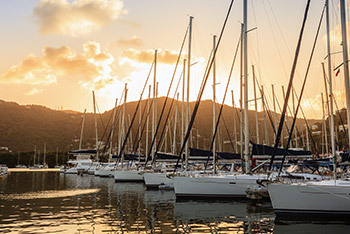 Given BVIs international reputation as a jurisdiction of choice for the domiciling of international companies, clients invariably form a BVI business company for the purpose of owning BVI registered yachts (as well as yachts registered elsewhere). However, it is possible for other persons, both corporate and individuals, to also qualify to own a BVI registered ship. So, for example, citizens and/or bodies corporate registered in the United Kingdom and its crown dependencies and overseas territories also qualify. Also qualifying are nationals of, overseas territories of, and bodies corporate incorporated in, member states of the European Community ("EC") or European Economic Area ("EEA"), although bodies corporate must have a place of business in such member state or overseas territory. Bodies Corporate Incorporated in a Member State of the Caribbean Community (CARICOM) or the Organization of Eastern Caribbean States (OECS) and registered in the BVI also qualify to own a BVI registered vessel.